I found this in my local Lowe's over the holidays. How could I pass up a life time of Flashabou for a dollar. 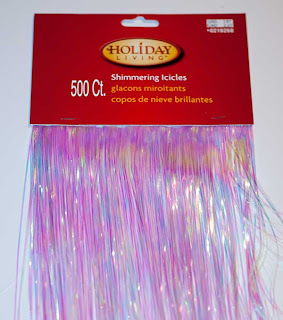 I'm calling it Ice Flash, 500 pices and 18 inches long. You never know where you'll find alternative materials. Looks like I'll be tying a lot of flashbacks. 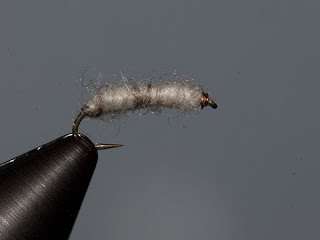 There are Rhyacophila larvae in every freestone stream. 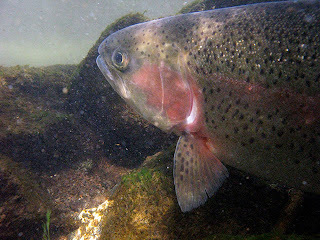 It is an abundant food source for trout. So abundant while nymphing I've impaled larvae, not once but many times. This is a simple an effective pattern. You can add a shell back but I've not notice the difference in hook-ups. 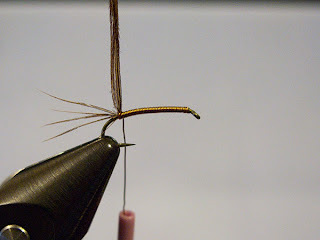 You've may notice that I don't have the partridge hackle sweeping back, this is to give the legs more action. 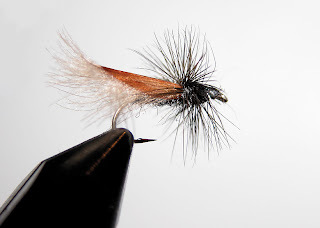 It is a dead simple pattern and very effective. Bob Jacklin's version landed him a 10 lbs. Brown Trout on the Madison between the lakes. 1. Mash down barb and secure in wire. 2. Apply Dubbing to thread. 4. 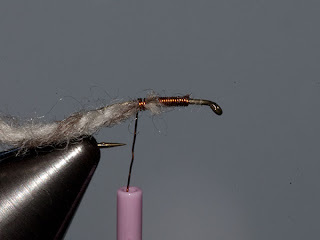 Wind wire forward to create a ribbing. 6. 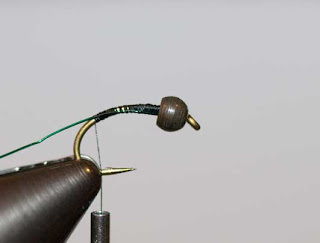 Wind on Partridge, secure and whip finish. At the Fly Fishing Show in Somerset, NJ today I was able to get from one of the vendors Sawyer's Killer Bug Yarn. This is not the original Chadwick's 477, but is the closest around. 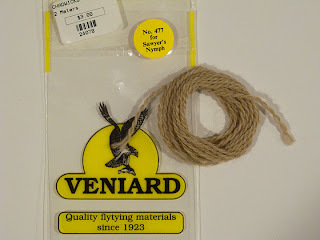 As you can see it is a tan yarn. The Rag Bug is my version of Frank Sawyer's Killer Bug. This is a excellent crane fly larvae imitation. The original Killer Bug is tied with Chadwick 477 (good luck find any). 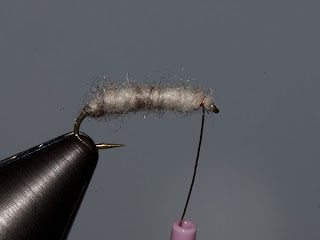 There are some substitute's, Chadwicks 477 Substitute from (http://www.lathkill.com/shop/index.php?productID=1658) and 477 Killer Bug Yarn from (http://www.fishingmegastore.com/view.php?module=products&productID=2530). Like me you may have a rag wool sweater that no longer fits. 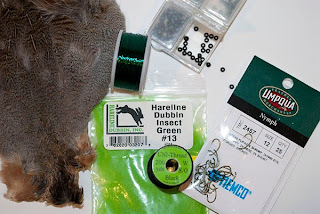 The color is simular to other crane fly larvae imitation most notably Walt's Worm tied with Hareline Hares Ear Plus #1. 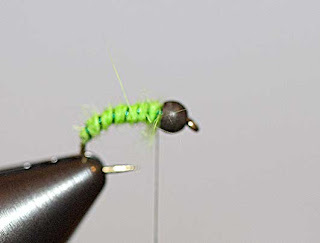 Both Walt's Worm and the Killer Bug are deadly patterns and dead simple to tie. 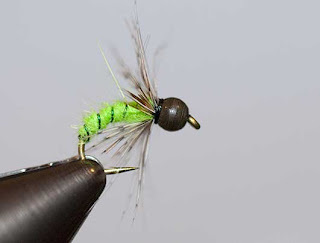 A simple image search of a crane fly larvae will show you how well this pattern imitates the natural. 1. Mash down barb and secure in vice. 2. 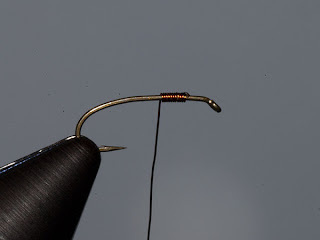 Wind wire onto hook. I use a dab of super glue to secure. 3. Secure Rag Wool and wind back. 4. Wind wire forward several wraps away from the hook eye. 5. Wind Rag Wool forward and secure with 1-2 wraps. 6. Trim away the excess. 7. Whip finish with 2 - 3 turns, and break off the wire. 2. 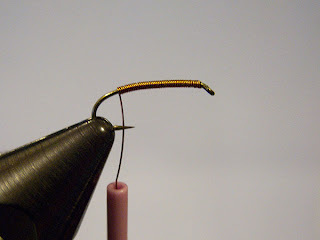 Wind wire onto hook. I use a dab of super glue. This helps me to keep my wraps tight. 3. 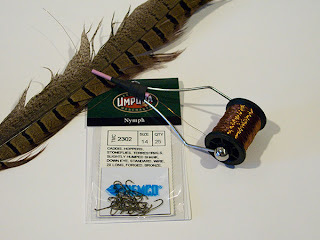 Secure pheasant tail fiber with 1-2 wraps. additional fiber then wrap forward. 6. 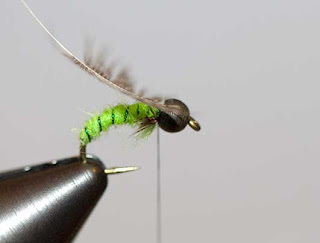 Pull fibers over for wing case (Forward). 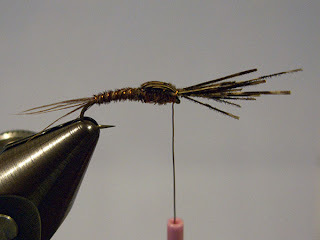 pull fibers back over the wing case. 8. Whip finish 2- 3 turns, clip excess fibers, and your done. 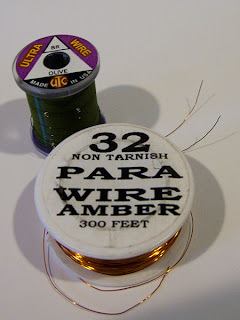 The Parawire is and it look's like a very good Ultra Wire substitute. 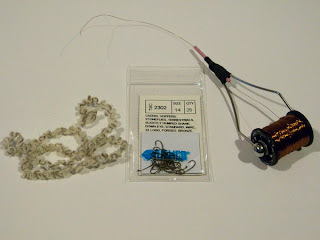 I purchased the .32 gauge, which is the same size as Ultra Wire's BR. 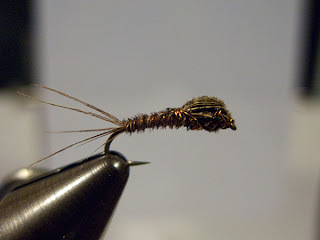 Good for Copper John's, Brassie's and ribbing. Sizes 10 to 18. Ozzie gave me permission to post this clip. 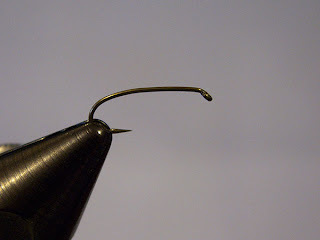 His latest video is "Trout Vision and Refraction" Volume 3 in the Underwater World of Trout series. In full disclosure I was hired be Ozzie to do the motion graphics work in this DVD. 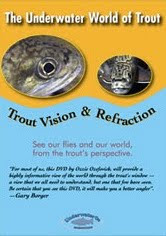 Gary Borger said: "For most of us, this DVD by Ozzie Ozefovich, will provide a highly informative view of the world through the trout's window—a view that we all need to understand, but one that few have seen. Be certain that you see this DVD, it will make you a better angler". This DVD will be available at Central Jersey TU's booth at The Fly Show and Ozzie is donating $5 of each sale to the chapter. Last night at CJTU meeting "Ozzie" of Underwater OZ fame showed Ralph and Lisa Cutter's DVD "Bugs of the Underworld". The footage is spectacular, and should be in every tier's library. I know I'm going to change some of my patterns after seeing this DVD. 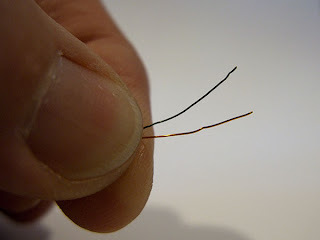 Found a new source for wire, looks similar to Ultra Wire. They have a good selection of colors and gauges for 12 to 34, but not in all colors. I ordered a several colors and will post a review soon. 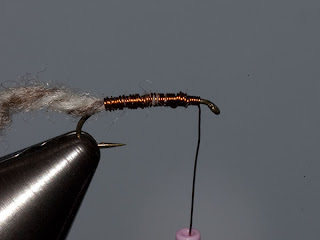 This footage of the creator of the Pheasant Tail Nymph has been up on YouTube for a year. With many great patterns less is more. 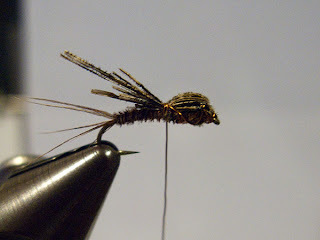 I don't know any one who doesn't have a American Pheasant Tails in their fly box. 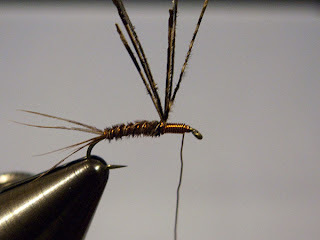 I love patterns with peacock, but the original is worth tying. This Rainbow decided to stay a while when I broke out the camera. A good winter pattern, try this one on warm mid days in February and March.